Inexplicably, my Cauldron Skittles review is the most successful article on this entire website. More traffic comes in every month about Halloween Skittles from last October than any article I write otherwise. I’m not quite sure how, considering it’s on the short side and written during a single lunch break, but here we are. I’m the Cauldron Skittles Guy. 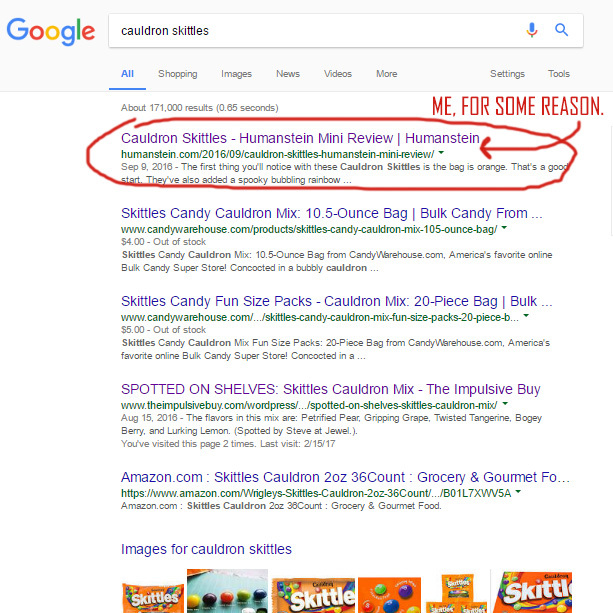 It ranks #1 on Google for Cauldron Skittles, meaning that my lowly impulse review of Cauldron Skittles ranks higher than the bigger guys in the junk food blogging space and the dang Skittles website itself. This sort of puts me in the sort of dubious position of reviewing Skittles. I’m not super crazy about Skittles, to be honest, but if it’s what the people want damn it, then the people will get more Skittles reviews than they know what to do with. I’m an artist. Here are Brightside Skittles. Those are Goosebumps stickers from 1997. 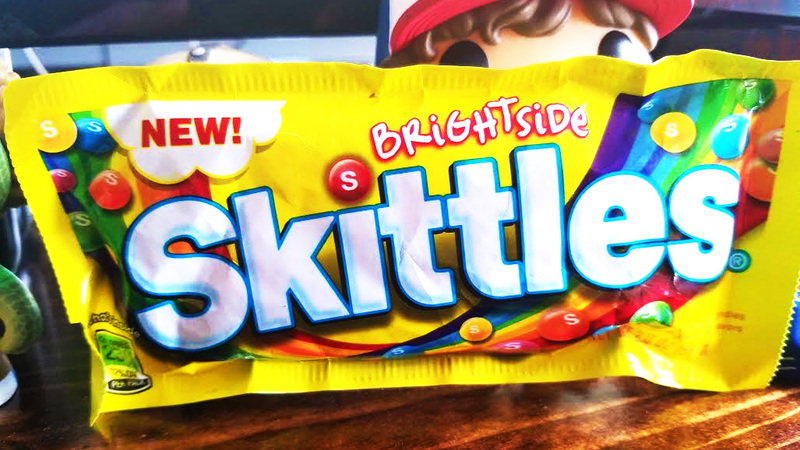 This go-around we’re focusing on Brightside Skittles, which look to have come out in the immediate aftermath of Cauldron Skittles during a time of the year that didn’t make any damn sense. These are brightly colored happy go lucky spring and summer Skittles, not hearty fall and winter Skittles if such a thing should exist (They don’t). Thankfully, they’re getting pushed out again at a much more logical time of the year: Spring! Still touting their bright and hopeful “NEW!” graphic nestled lovingly in the bosom of a cartoon cloud. 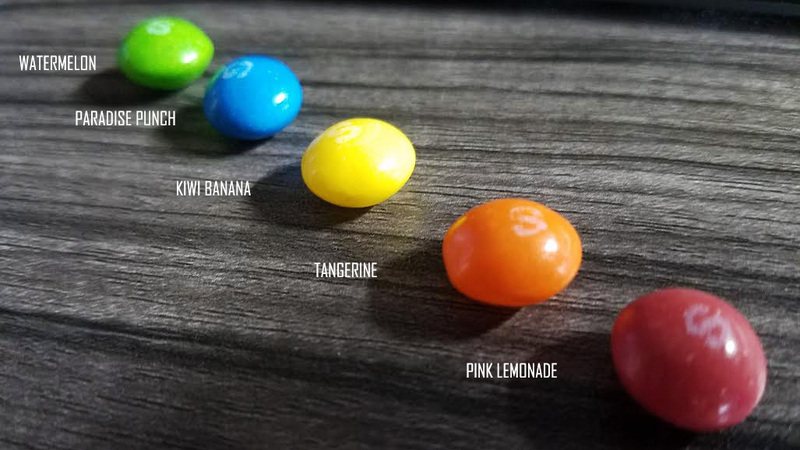 The full lineup of Brightside Skittles flavors, including Watermelon, Paradise Punch, Kiwi Banana, Tangerine, and Pink Lemonade. Shockingly, and quite wonderfully, this batch of Skittles is composed of almost all new flavors. 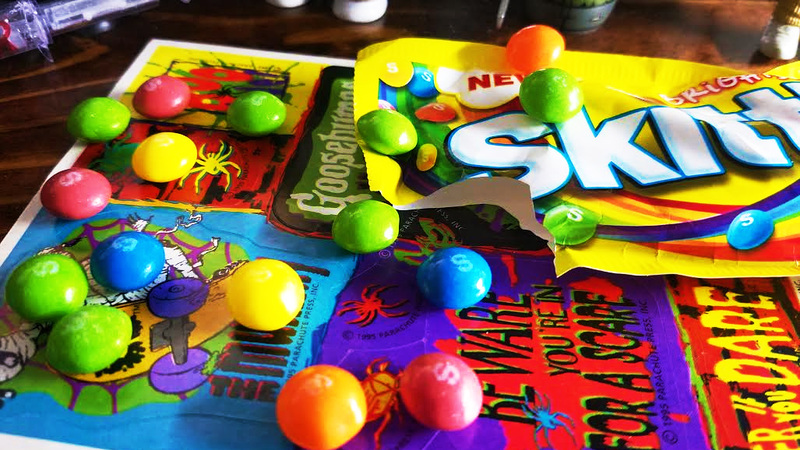 The Watermelon skittle has appeared in the since discontinued Skittles Riddles assortment, and outside of that, the only returning flavor is Tangerine, which was included in Cauldron Skittles back in October. Barring those two, these are all brand spanking new Skittles flavors. What a time to be alive. Let’s dive in, shall we? We’ll start with the returning flavors, Tangerine and Watermelon. Tangerine is still tangerine. This time it’s not “Twisted”, but it’s still not Orange, as I speculated it might have been be back in the Cauldron Skittles review. It instead still a true, refreshing tangerine flavor. Tangerine is a simultaneously mellow and bright flavor one might not expect a Skittle to be able to properly replicate, but it’s right on the money. Surprisingly less tart than the standard Orange Skittle, with a flavor that still longingly reminds me of Ecto-Cooler (RIP). I am still a big fan of this Skittle. This is a good Skittle. Next up is Watermelon. Again, “standard” watermelon is a flavor that’s found its way into various Skittles products over the years, most notably the Skittles Riddles promotion from way back in the hazy days of 2012, where we were more concerned with the end of the world than with novelty Skittles flavors. We did you wrong, Watermelon Skittle. I’m glad you’re back. This little green guy is good. A mature, sweet Skittle with just enough tartness to make sure you know you’re eating a Watermelon product here. This honestly makes me think of Japanese candy flavors, which are noted for being more “adult” and reserved. After those two returning favorites we’re in the Wild West here, with only our taste buds and the light reflecting from the Brightside Skittles to guide us. Up next is Paradise Punch. Blue Skittles are invariably the best Skittles. It’s just the truth. The blue flavor, regardless of what that blue flavor is supposed to represent, is the best flavor. Always. Invariably. Here we’ve got a traditional fruit punch with a little extra zing and brightness (get it?). It’s good. Fruit punch is a pretty safe flavor, but it’s safe because it’s almost always great. I’d eat a bag full of nothing but these Skittles. I now want to do that. Please mail me your excess Paradise Punch Skittles and sign my Change dot Org petition to force the Wm. Wrigley Jr. Company to produce them immediately. The back of a package of Brightside Skittles showing the full flavor assortment. Also a sliver of Dustin from Stranger Things’ head. Alright. Before we get into this next one here, I’m going to level with you. Banana is the grossest flavor candy can be. Even people who love bananas (which I do not count myself among) tend to dislike banana flavored candy. 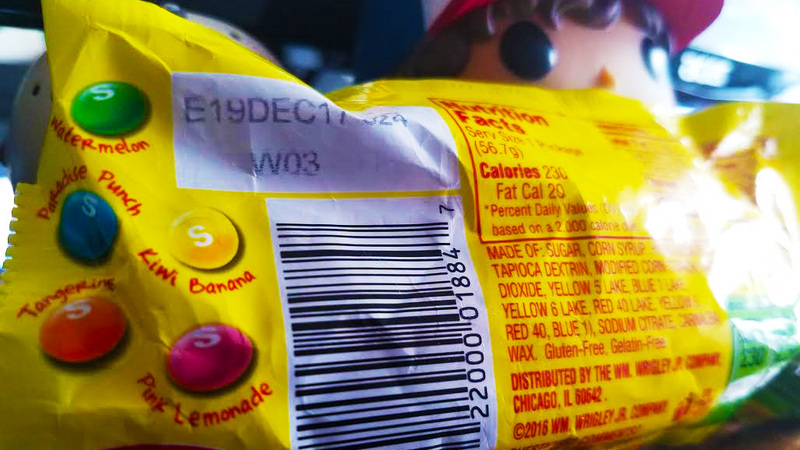 It’s such a reserved, quiet flavor that pumping it up in the manner through which candy makers define their cartoonish caricatures of fruit flavors turns it into some nightmarish flavor that bears only a passing similarity to banana. Kiwi is also almost always an afterthought. I do not seek kiwi out. As such, I thought it would be pertinent to include someone who does like banana and kiwi flavored candy here as a counterpoint, should I have ended up hating this Skittle. Here is my friend Nick and Darius each ingesting a Kiwi Banana Skittle. Nick is a mellow, affable man who enjoys many things, banana flavored candy included. Darius (of D Plays Games) also led me to believe he liked banana which turns out to not be the case, but I’m including his take anyway. As far as my personal take is concerned, I mostly agree with their reactions. The Kiwi flavor is more towards the front here, but the banana flavor is definitely present. Again, as though making these Skittles for an audience that actually enjoys the taste of fruit, the flavor is more mellow and organic than I was expecting. I’ve gotta say, I actually like these. I was very, very prepared not to, but here we are. This is also a good Skittle. Even an ol’ banana hater like me can find something to like about the Kiwi Banana Skittle as found in the new Brightside Skittles. Last, but certainly not least, is the flavor I was most excited to try from this batch of Skittles: Pink Lemonade. I have a serious fondness for pink lemonade, with its bright and simultaneously indescribable fruit flavor and completely indeterminate origins… Seriously, both popularly proposed origin stories for pink lemonade are insane and nonsensical. They are that Pete Conklin just wanted to make red lemonade back in 1857 and dyed the water with a pair of red horse rider’s tights or that at a guy named Henry E. “Sanchez” Allott (whose obituary contained this information) dropped some cinnamon candies into a jug of lemonade at some point and was like, huh, that’s cool. Those are the options. That’s how this popular drink entered the world. One of those ways. Anyway. Pink Lemonade is good even if its hard to describe. That’s about how I feel about the Pink Lemonade Skittle as found in this new Brightside assortment. Very delicious, completely impossible to pin down, and all the better for it. Sometimes food should have a little mystery to it. That’s okay sometimes. VERDICT: Buy ’em. These are a bright, flavorful and pleasant set of Skittles we got here, y’all. You can find them for sale at Walmart and Walgreens for sure, and I’ve spotted them at more than a few gas stations as well. As an aside, I might need to recalibrate my stance on Skittles. I’ve written about them twice and the reviews have both been glowing. Maybe it’s time to come to terms with the fact that I like Skittles. 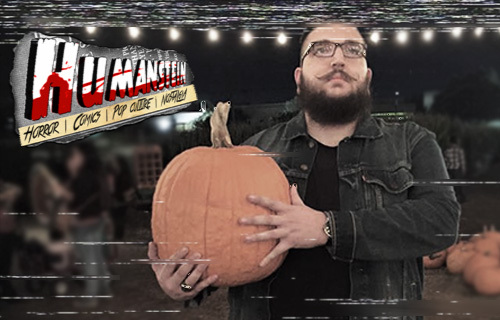 Hi, My Name Is Humanstein and I Secretly Like Skittles Enough To Write About Them A Lot.